chronic glomerulonephritis characterized by mesangial cell proliferation, increased lobular separation of glomeruli, thickening of glomerular capillary walls and increased mesangial matrix, and low serum levels of complement; occurs mainly in older children, with a variably slow progressive course, episodes of hematuria or edema, and hypertension. It is classified into three types: type 1, the most common, in which there are subendothelial electron-dense deposits; type 2, dense-deposit disease, in which the lamina densa is greatly thickened by extremely electron-dense material; type 3, in which there are both subendothelial and subepithelial deposits. a chronic form of glomerulonephritis characterized by mesangial cell proliferation, irregular thickening of glomerular capillary walls, thickening of the mesangial matrix, and low serum levels of complement. 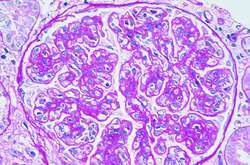 Also called mesangiocapillary glomerulonephritis. 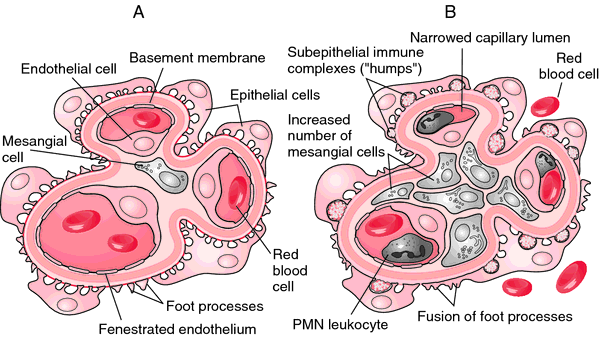 A descriptive term for a pattern of diffuse glomerulonephritis (GN) characterised by mesangial cell proliferation and basement membrane reduplication. MPGN accounts for 5–10% of all GN; it is caused by immune deposits in glomeruli, and often progresses to chronic renal failure. Primary, typically linked to HCV-induced cryoglobulinaemia, or secondary to various infections including infectious endocarditis, malaria or in HCV infection due to intraglomerular deposition of immune complexes containing HCV, anti-HCV IgG, and IgM rheumatoid factors. Presentation ranges from nephrotic and nephritic syndromes to asymptomatic proteinuria and decreased serum C3. Symptomatic; also treat underlying disease. • Type I—60–70% of cases; subendothelial electron-dense material composed of C3, IgG, early complement components (C1q, C4, ±IgM). • Type II—Ribbon type intramembranous dense deposits of C3 in lamina densa of glomerular basement membrane; also mesangial proliferation, crescentic GN. • Type III—Extremely rare; subendothelial (type-I) and subepithelial immune deposits. Chronic glomerulonephritis characterized by mesangial cell proliferation, increased lobular separation of glomeruli, thickening of glomerular capillary walls and increased mesangial matrix, and low serum levels of complement; occurs mainly in older children, with a variably slow progressive course, episodes of hematuria or edema, and hypertension. Daina E, Noris M, Remuzzi G (2012) Eculizumab in a patient with dense-deposit disease. 2014) Eculizumab therapy in a patient with dense-deposit disease associated with partial lipodystropy. The MPGN due to alternative pathway dysregulation may be subdivided into dense-deposit disease and C3 glomerulonephritis.